When the Director of Corporate Communications for the NHL starts sending updates about an NHL Tweetup you know it’s legit. But regardless of its official status, a tweetup is basically a get together for those who use Twitter. In many cases it’s because they share a passion for a similar topic and tonight, it was all about hockey. 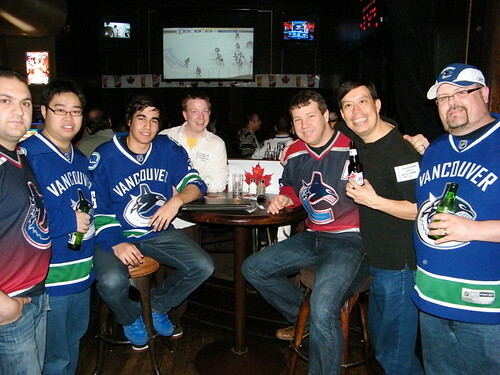 It just so happens the first-ever Vancouver NHL Tweetup event at the Shark Club coincided with the first Canucks playoff game of 2009 so many gathered to watch the game with friends, contacts, and new Twitter faces. This afternoon I posted an update to Twitter about the Canucks and moments later I was contacted by ShowTime Tickets (an independent ticket broker). I was offered tickets for tonight’s game (straight up, in exchange for nothing). I gladly accepted even though I was accused on Twitter of supporting “scalpers” — by a season ticket holder who routinely sells their tickets off to the highest bidder online — but I digress. As a result, I pulled Duane out of Chilliwack (since John was working) and headed to the first game of the series versus the St Louis Blues. 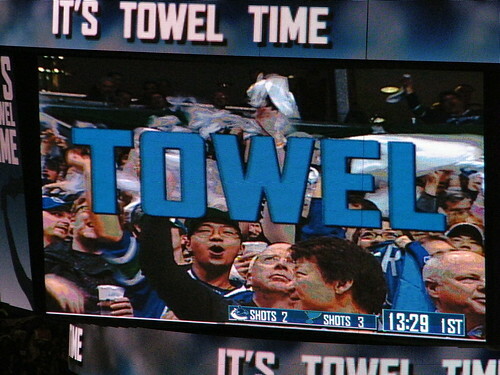 The crowd was charged in GM Place and towel power was out in full force. The Go Canucks Go chants seemed never-ending and despite several poor calls (and even though a wave couldn’t get started inside GM Place), our team came out on top, beating the Blues 2-1. There are several people who made tonight very special including Molson who I hear sponsored a round at the NHL Tweetup, and ShowTime Tickets for getting me in to the game. I would also like to send a shoutout to all those who attended the tweetup such as Richard, Keith, Brian, Dave, Sam, and even Hez who made a fabulous appearance. I hear at least 20-30 people joined the group throughout the night. On my way home tonight cars were still honking their horns and fans in blue jerseys were still on the streets chanting and cheering in victory. You would think we had just won game seven of a hard-fought series but I think this town is just proving once again that its heart is full of hockey. The second game of the series is this Friday night at GM Place, the puck drops at 7:00pm. Update: Sam Chan has his NHL Tweetup post up now and it includes this super fun video that he made throughout the night. NHLTweetup Hashtagging [Canucks Edition] from Sam Chan on Vimeo. 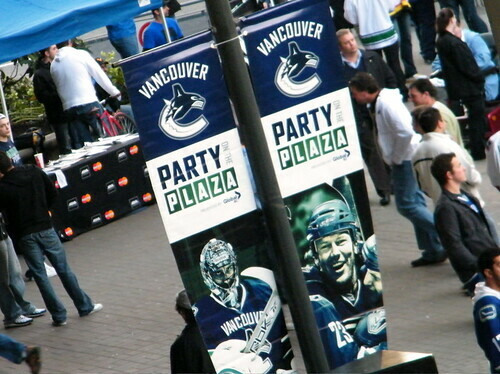 It’s fun to be a part of the Canucks Fan Zone live blog when we’re at GM Place but it doesn’t matter where we’re located, really as the fan community is always thriving online, from across the globe. You can always tell when there’s a game as the term “Canucks” becomes a top ten trending topic on Twitter — a service used by millions worldwide yet the Canucks nation can still make an impact. Thanks for the shoutout! I was like…when was this photo taken? The game tonight was awesome. Did you see the article about how we’re totally sold out of playoff tickets and the St. Louis mascot is camped on the roof of the arena until *they* sell out because no one is buying?? 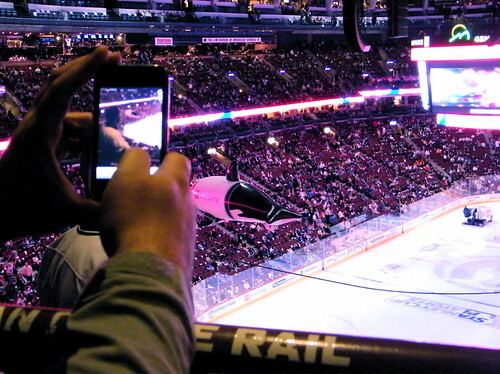 I had a great time going with you to my very first NHL Tweetup. 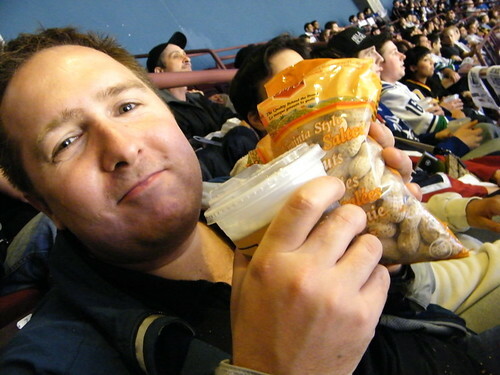 It was my first time at a sports bar during a Canucks playoff game, and I’m glad it was with you! Sorry to have missed Duane. 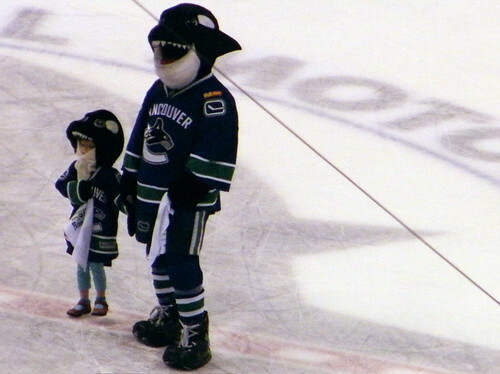 Someone get Raul a Canucks Jersey, Stat!! So that’s why Duane had peanut shells all over him! I remember him tweeting about it. 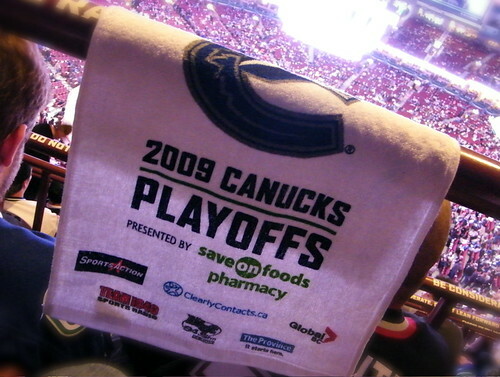 I miss my ’94 Playoff Towel, we also got silly white pompoms too!! I want it back damn it! The towel, not the pompoms . I was listening to the first period in the car on the way home from the office (yes it takes me that long to get home ;)) and listening to the @Team1040 crew, the crowd singing O’Canada, the Cheering, the booing all send shivers down my spine. I listened to the 2nd and 3rd period via my iPhone which was pretty cool! 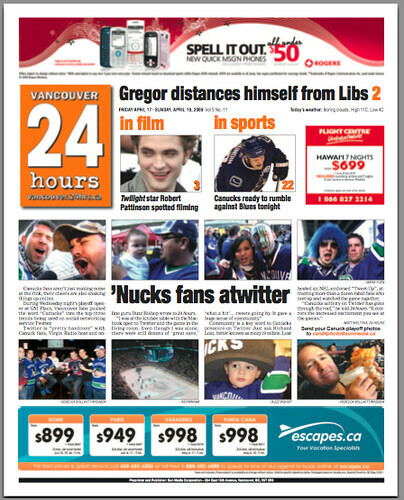 Will always be a Canucks Fan! @Paul I know, I’m glad we can pack the house – I bet those Blues home game tickets are super cheap too. @Tyler everyone was singing at the top of their lungs – there were also people singing along to the Star Spangled Banner. Nice coverage of the evening Rebecca, and nice work on the video Sam. @Mozy19 put on a nice event. Was nice to meet some new tweeps! Thanks for all the linkage and props! Working the broadcast like I do, it’s too easy to miss all of these things going on outside the rink in terms of not know they’re there as much as being bummed out not seeing everyone. That was my first playoff experience as well. Once the stress settled down, it was amazing.